This might be a little bit of a late notice, but our great friend Trudy, the brain behind the moniker acronym of “Team QAK” is having a welcome back party for us tonight at her apartment in Williamsburg, Brooklyn. If you’re in the city and haven’t already gotten the email from her or from one of us and you want to come welcome us back, we want to see you. And now that I’m finally back in front of a fast computer with photoshop all day long, I’ve been able to stitch together the panoramic photos I’ve been taking during the trip. Another great friend, Halston, loaned me her Canon G10, which is a fantastic camera that I wish I didn’t have to give back. It’s got a spiffy function that makes taking panoramic photos like this somewhat easier. You can click on them to view a larger image. They’re also up on my flickr account. This was the Columbia River Gorge in Oregon, on the very first day of our trip. Looking at these photos again reminded me that I’d almost forgotten how many beautiful things we passed by and how long ago it really was. This was between Malta, Idaho and Snowville, Utah. Flat. On the way up & over the Rocky Mountains. At the top of Logan Pass, where we crossed the Rocky Mountains. It was one of the most spectacular views of our trip, and it was absolutely freezing up there. The couple to the right side of the photo was huddled beneath a blanket. Bear Lake, from the bottom. It’s the lake you can see in the photo above, from the top of the mountain. The Needles, one of many things from our favorite state, South Dakota. The Badlands. Also in South Dakota. We’ve made it! BUT WE’RE NOT THERE YET! Between Waynesboro & Easton are several Pennsylvania locales I’ve heard a lot about but never really been to. Lancaster, for instance, is supposed to be the Amish capital of the world (even though the largest population of them is in Ohio). We didn’t come across any Amish until we were near Kutztown. We did hit up the recommended “Lancaster Dispensary” where the bartender played Yankee Hotel Foxtrot in it’s entirety, making us nostalgic for our iPods, and the waitress invited us to pitch our tent in the sprawling 1/4 acre backyard of her historical landmark home. This Lancaster back yard extends all the way to the next street over. It's HUGE! Out of place “on the wrong side of the tracks” next to tenement-style brick buildings, Susannah’s wood sided 1.5 floor bungalow’s property extends way back until the next block. As sleep crept closer, the arbitrary outbursts of her neighbors became less & less startling, and we slept like babies. The next day, we stopped in Reading, where I’ve only been once before to buy some unstylish stonewashed jeans from the city’s famed discount outlet stores when I was a teenager. From there, I called Mike Fegley at the Allentown Brew Works to tell him I was going to be there in a matter of hours to say “hi”. Allentown, Bethlehem & Easton make up the third largest metropolitan area in Pennsylvania behind Philadelphia and Pittsburgh. The Billy Joel song is about that Allentown, but it was based more on Bethlehem, where the factories were being torn down and have recently been turned into sprawling casinos. Easton is famous for Crayola Crayons, Larry Holmes (who beat Muhammad Ali back in the early 80′s), and being the second place that the Declaration of Independence was read publicly. Allentown doesn’t have all that much going for it, and Mike was disappointed in his attempts to attract the Bicycling Hall of Fame to the unused storefronts across from his brewery. Still, in spite of the perceived disinterest express from his community, we boldly encouraged him to continue the Tour De Brew – the only USCF sanctioned event that goes THROUGH an occupied building before continuing on to the streets. A while ago, I had screened a youtube video he had cobbled together of the race after my Mom had saved a clipping from the Morning Call to show me last Christmas. It’s open to amateurs, and if he does this event again (which runs concurrently with a beer fest), I’ve promised to come & drag some New Yorkers with me. I was going to lead twoarmparty into Easton by the Lehigh River Canal bike path, but we were already a few beers deep and on the last 20 miles of an 85+ mile day, so I skipped the scenic & went for the direct, which brought us past two Blockbusters I used to work at, my High School & Middle School, a Laneco I got caught shoplifting at, the Dixie Cup factory, and some of the less lovely parts of downtown Easton. Then we rolled up on Pearly Baker’s where my Dad was waiting for us with several empty seabreezes in front of him. Apparently he thought we might get there quicker. Family & friends rolled up and we had a great time beginning a relaxing day in Easton. Quinn did a great job recapping that in the last post. 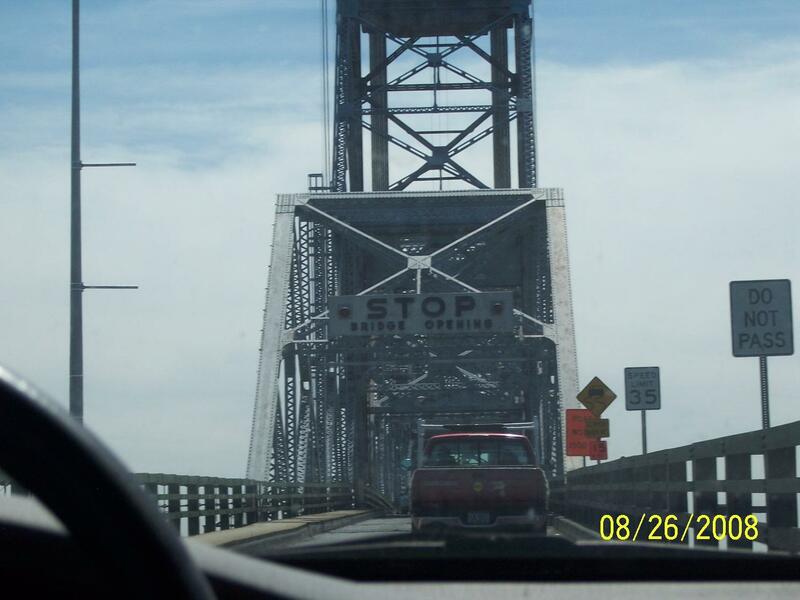 Someone else’s photo of the bridge we illegally rode over. There was no other way! The best part was how I got a flat tire at the very base, by running over a drainage grate. There are few things in life I’m afraid of. I am, afterall, fearless. But of those few things (Tornadoes, opening car doors, wet metal construction plates, and expansion joints on bridges), I pretty much ran into two of them crossing this bridge, because having a flat tire makes you just about as stable as riding over a wet metal plate. And yes, as Quinn mentioned, we stopped on the other side of the bridge to take that Jersey State sign photo (impressive sign, New Jersey!) and fix my flat. That took a good 15 minutes, and nobody did anything about it. So the moral of the story is IGNORE THE LAWS, KIDS! I wish I had known this when we were at the Crayola Factory the day before…. two.arm.party is powered by	WordPress 3.3.2 and delivered to you in 0.421 seconds using 40 queries.